Potted Dwarf Jade Plant, Portulacaria afra is also called Mini Jade Plant, Elephant’s Food, Elephant Bush, Elephant Plant, Miniature Jade, Spekboom, Yellow Rainbow Bush, Porkbush, and Small Leaf Jade. This very unusual and colorful plant is a slower growing succulent with dark green leaves and dark stems. It is an excellent house plant for a sunny window. It is native to Africa and likes to go dry between waterings. It has pale pink flowers. The fleshy trunk, branches and leaves are able to store water for a long period of time which makes it particularly well suited for offices, dormitory rooms, or anyone not wanting to be a slave to their plants. The Elephant Bush or Dwarf Jade Plant can grow very well even in a shallow pot which means it is ideal in a dish garden or as a bonsai tree. The Dwarf Jade Plant looks good growing alone or with other succulents. The soft round green padded Dwarf Jade Plant leaves look similar but are smaller than the leaves of the Jade Plant. It also does not grow as large or spread out as wide as a Jade Plant. 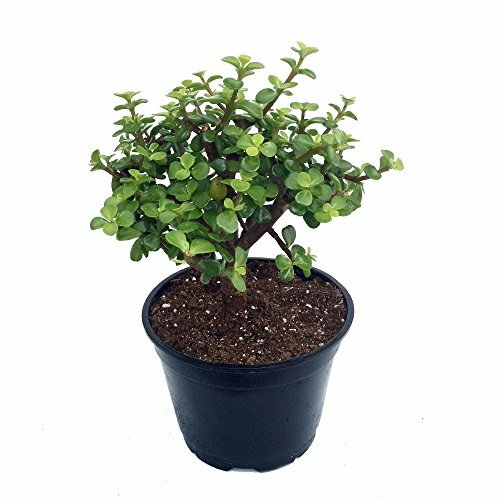 The Portulacaria afra Mini Jade Plant or Dwarf Jade Plant is very popular as a Bonsai Tree. It is extremely easy even for beginners to prune the Dwarf Jade Plant into a miniature tree-like plant. It grows slowly and in time the thick trunk and branches make it look like a weathered old tree. This live potted Dwarf Jade Plant is shipped in a 6” pot. It is not mandatory but after you receive it we recommend you repot it to a nicer looking and possibly larger pot. The Dwarf Jade Plant is a great plant for children to start learning how to grow houseplants or in an outdoor garden. In the spring or summer, it is easy to propagate cuttings from the Dwarf Jade Plant. In South Africa the leaves are still commonly used in salads and soups. This plant is grown and shipped through Hirt’s Gardens which has a great reputation for quality plants sold online. A Dwarf Jade Plant will be a great addition to your succulent collection.